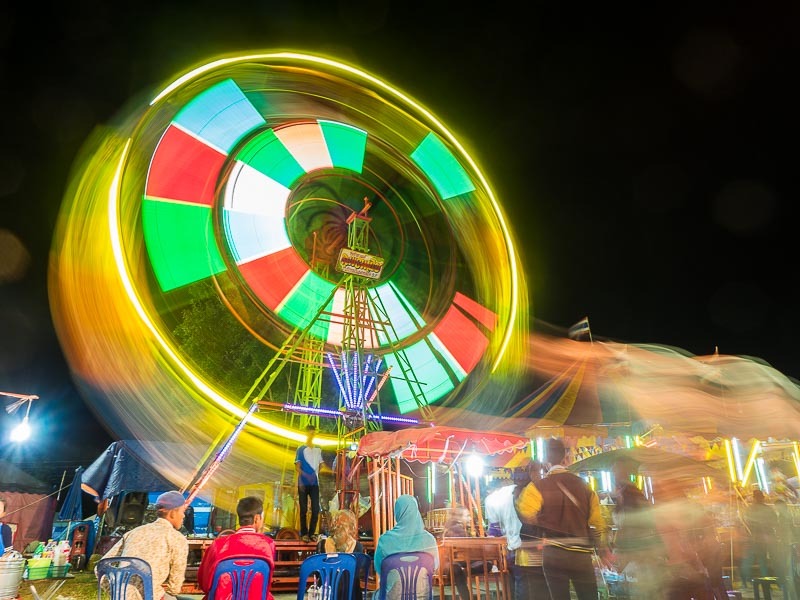 A ferris wheel at a fair in Narathiwat. This is 2 1/2 second time exposure, ISO 200 at f9. I went to a provincial fair while I was in the south. 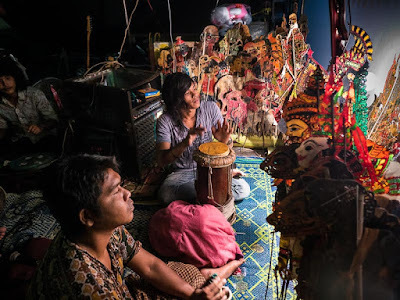 I went to photograph the "wayang" a traditional Indonesian shadow puppet play. The wayang is also popular in Malaysia and Malay influenced parts of Thailand, like the Deep South. This is not the rainy season in the South but it poured that night and the wayang, which is performed outside, was rained out. Drummers rehearse before the wayang show, which was eventually rained out. I wandered through the midway before the rain started and made a couple of photos of the ferris wheel, including the photo at the top of this page. I've written before about some of the technical innovations in the Olympus bodies, including the in body image stabilization. This is another one of those. The photo at the top of the page is a 2 1/2 second long time exposure. Hand held. No tripod, monopod or other support. Zoom into the sign in the middle of the wheel and you'll see the type is perfectly clear. Likewise, the guys sitting on the left side of the frame are sharp. I was sitting on the ground in front of the ferris wheel with the camera cradled in my hand, but that was the extant of it. This is not a picture I would have been able to make with my Canons.